Simon vs. 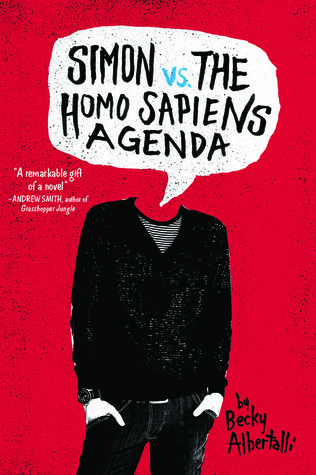 The Homo Sapiens Agenda has been gaining a lot of hype recently in the book community. I remember reading the synopsis on Goodreads before the book had come out and I knew that it would be something that I would probably enjoy. Goodreads synopsis: Sixteen-year-old and not-so-openly gay Simon Spier prefers to save his drama for the school musical. But when an email falls into the wrong hands, his secret is at risk of being thrust into the spotlight. Now Simon is actually being blackmailed: if he doesn’t play wingman for class clown Martin, his sexual identity will become everyone’s business. Worse, the privacy of Blue, the pen name of the boy he’s been emailing, will be compromised. With some messy dynamics emerging in his once tight-knit group of friends, and his email correspondence with Blue growing more flirtatious every day, Simon’s junior year has suddenly gotten all kinds of complicated. Now, change-averse Simon has to find a way to step out of his comfort zone before he’s pushed out—without alienating his friends, compromising himself, or fumbling a shot at happiness with the most confusing, adorable guy he’s never met. Simon vs. The Homo Sapiens Agenda was everything that I expected it to be. It was cute and quirky and charming and it had all of the right ingredients to make a perfect young adult coming of age story. It was extremely fast paced and although that is something that I generally enjoy while reading a story, I feel as though there could have been a lot more detail added throughout this novel. Some moments moved a little too quickly while others felt a little out of place. 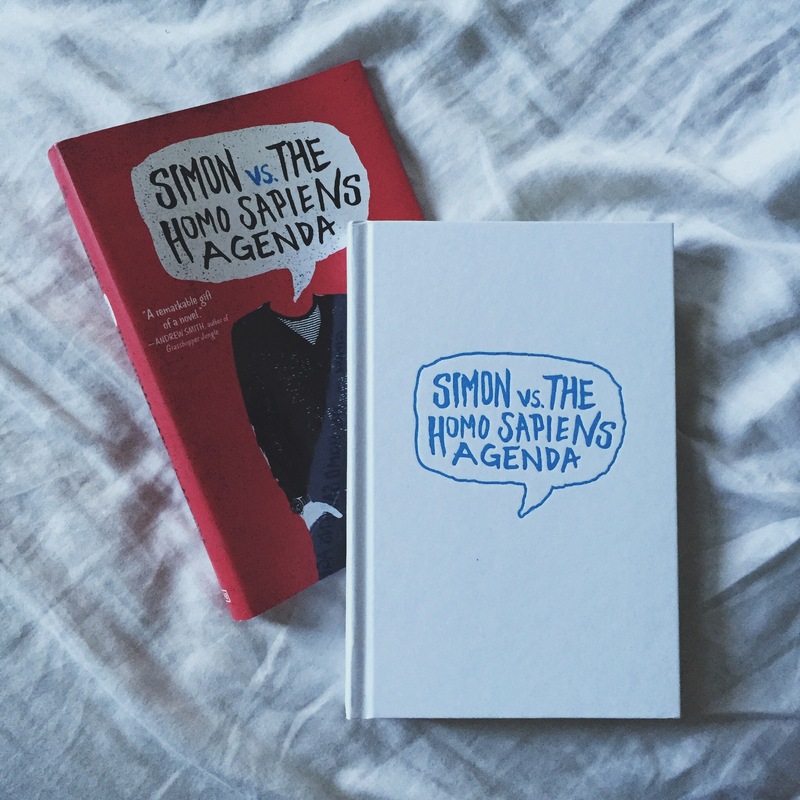 I definitely fell in love with Simon and the way he was written. He had a very comedic voice and I found him to be quite relatable. I loved his inner voice and the quirkiness of it. I just wish that he were written with a little more detail and the same goes for his friends and family. The side characters just felt a little flat to me and I think that may be because there just wasn’t enough time spent writing them. Simon’s best friends Leah, Nick and Abby had their moments where they fit into the story and were written well, but then there were other instances where they just felt awkward and misplaced. I think the character of Martin added a bit of drama to the story and that his moments within the story were necessary and relevant to the plot, but I wish I knew more about what was making him tick. I’m sorry, but Simon’s parents felt very awkward to me. Obviously, I love the fact that they were loving, open minded parents but most of the moments that involved them felt very cheesy. His sisters, Alice and Nora were decent, and I know I’m starting to sound like a broken record, but once again, there just needed to be more detail into who they were as people and their role in Simon’s life. I loved the emails that were being written back and forth between Simon and his mystery crush, known only as “Blue”. I think that these moments were the best part of the novel. I loved the idea of the mystery behind Blue’s true identity and I loved the little hints that the two boys would pass back and forth between one another. Unfortunately, the mood was killed when we find out who Blue really is. Maybe it was just me, but I found the big reveal to be quite underwhelming and a little bit of a let down. Once again, the story started to move to quickly after the reveal and I feel like there could have just been something more that seemed to be missing. Like I said earlier, this story has all of the right ingredients to make for a perfect LGBTQ coming of age story, but the only thing missing was that perfect secret ingredient to tie everything together. Pingback: Top 10 Tuesday – Debut Authors Who Have Me Looking Forward to Their Sophomore Novel | big city bookworm.